Stop. Take a breath. Listen to the quiet and look closely at the first photo. This is going to be a tough read. But an important one. In observation of International Holocaust Remembrance Day, today's post is dedicated to those who died - and to those who survived - the Holocaust. Photos of children who were killed, along with name, age of death, city, country and other biographical details are printed on the slips of paper above. 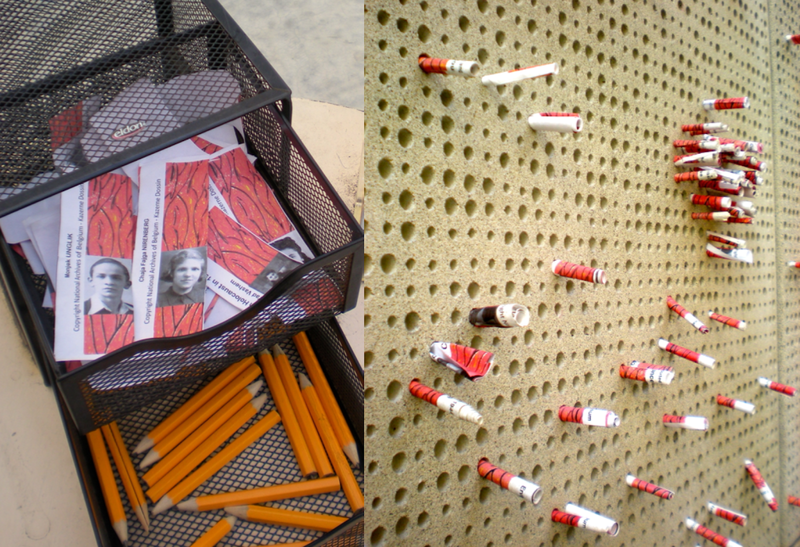 This is an ongoing project, run by survivor/artist Gabriella Karin. If you know of a family with photos of children who perished, please contact her at rememberchildren@earthlink.net. Holocaust survivors give tours and talks throughout the day at the museum, which is how we met Gabriella, who lost seventy-five members of her family. "I was a little girl, everyone in the neighborhood got along. Jews and non-Jews mixed with ease, came to my parents' shop, were friends. No one could ever have imagined what was to come. We would never think it was possible." We leave the open air memorial and walk toward the museum. 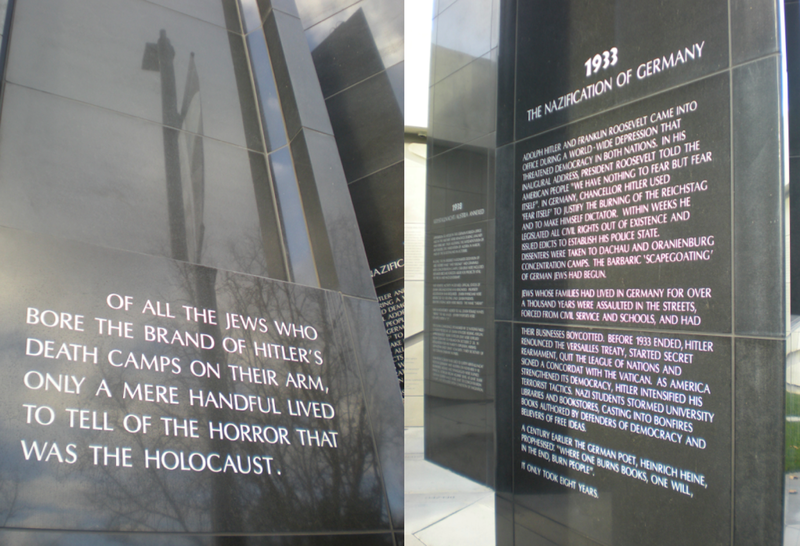 Six granite monuments, each representing one million of the six million Jews murdered, together symbolize smokestacks of the death camp crematoria and give important, historical events that led up to the horror that was the Holocaust. The memorial sits in a quiet part of Pan Pacific Park. This is not the normal way one would enter the museum, but I wanted to start with the children today. The museum is situated underground, covered with walkways and natural grasses, making it one of the largest rooftop gardens in California. The 'smokestacks' can be seen in the background and the paths are confusing, seemingly unending. Where are we going? What lies ahead? The journey is full of ominous symbolism, without even entering the museum. Winding our way back, we turn the corner and drop down into to a long, confining tunnel that burrows underground. A foreboding feeling accompanies each step we take. One last glimpse of sky, and the corridor closes in on us as we step through the doors, into the museum and the somber reality we're about to confront. Tree of Testimony is a video sculpture comprised of seventy exhibit screens, or 'leaves', which over the course of a year displays testimonies of more than 51,000 Holocaust survivors taken from USC Shoah Foundation Institute Archive. Shoah means 'catastrophe' in Hebrew and is used interchangeably for the term Holocaust. For younger readers of this blog, the Shoah Foundation was founded by Steven Spielberg after he made Schindler's List, a highly recommended movie documenting one man's efforts to save as many Jews as possible in his own unique way. The sloping corridor heading deeper underground symbolizes the awful descent into the darkness and terror that victims experienced. Although the Los Angeles Museum of the Holocaust is the oldest Holocaust museum in the country, the building is new. 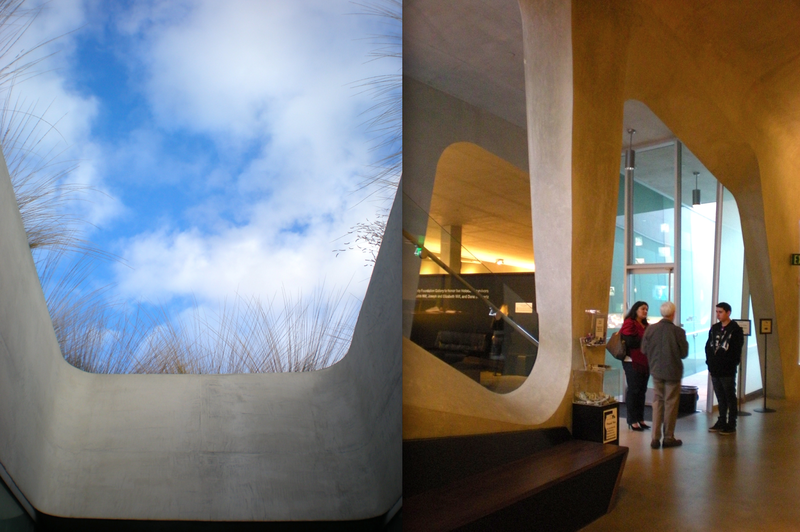 Opened in 2010, it was designed with great sensitivity by Belzberg Architects. It will soon be LEEDS certified, and earlier this month it was selected by the American Institute of Architects as a 2014 recipient of the Institute Honor Awards for both Architecture and Interior Architecture. This is an exceptional accomplishment, as winning in two categories has happened only six times in the award program's 65-year history. 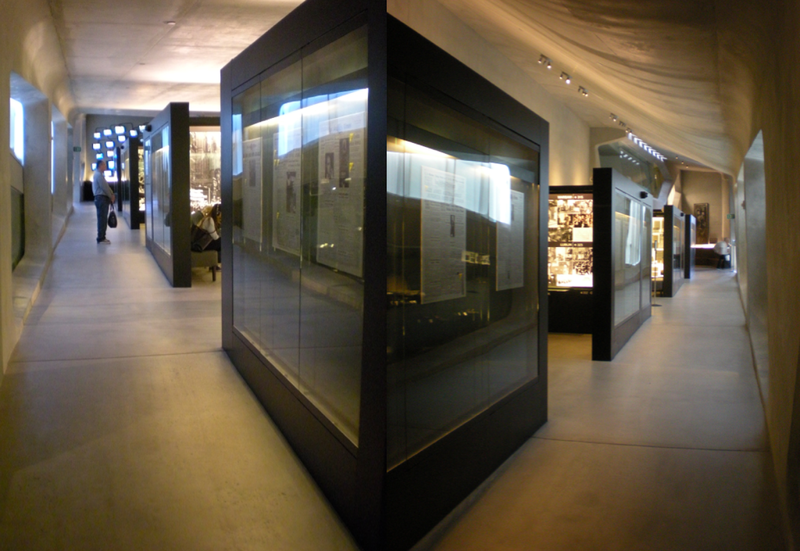 Galleries are accessed from the main corridor, depicting life before, during, and after the war. I read The Diary of a Young Girl by Anne Frank for the first time at age eleven, younger than Anne was when she began writing it at thirteen, just as she and her family were forced to go into hiding during World War II. The book had a profound impact on me, and so did the experience of entering 'her room' all these years later. The photo of Miep Gies, taken on her wedding day, surprised me by revealing a stylish, young woman. Miep worked in the Amsterdam office of Anne's father, Otto, and was a friend to the family. For over two years, as eight people hid from the Nazis, Miep bravely risked her life to supply food and provisions - until the group's arrest and deportation one August morning. Miep found Anne's diary on the floor later that day and luckily, she put it in her desk without reading it. Anne named Miep and the four others who helped hide them; had Miep known that, she would have been obligated to destroy the dangerous evidence. The war may have altered or even ended the lives of musicians, but the music played on. Life after liberation brought its own complex issues. Russians liberated Auschwitz on January 27, 1945, and Allied troops followed. But these soldiers were unprepared and ill-equipped to deal with victims' overwhelming physical and psychological needs. Below, a soldier's heart wrenching letter tries to put into words the apocalyptic conditions they witnessed. 600 people participated, half were killed, and of the remaining 300, only 50 survived. 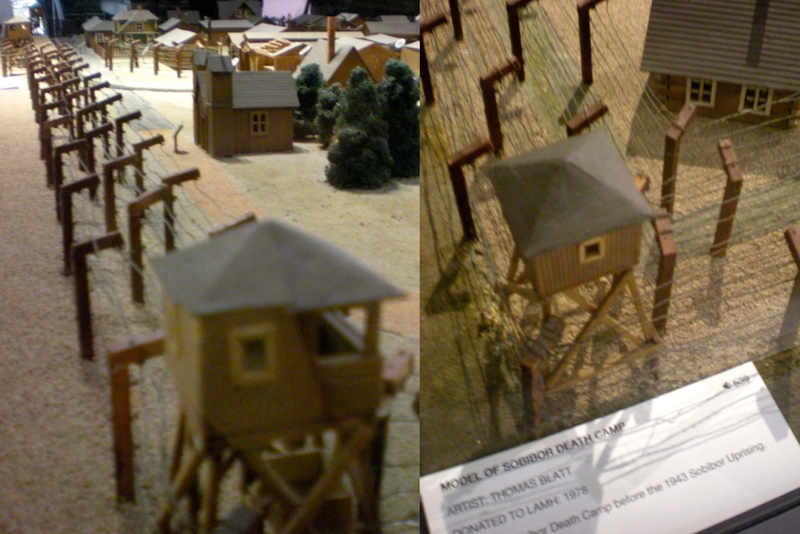 Shortly thereafter the camp was bulldozed, but Mr. Blatt estimated that 250,000 were put to death prior to its demise. "People in a concentration camp had about a 25 percent chance of survival," he said. "At an extermination camp, those chances were virtually zero." In the course of his escape, Mr. Blatt fell and was caught under the barbed wire fencing that collapsed with the chaos of guns, guards and fleeing prisoners. Being trapped actually saved his life, as those running ahead of him were blown up by buried land mines. He struggled out of his coat and bolted into the forest where he and the other escapees successfully hid from Nazi search parties. 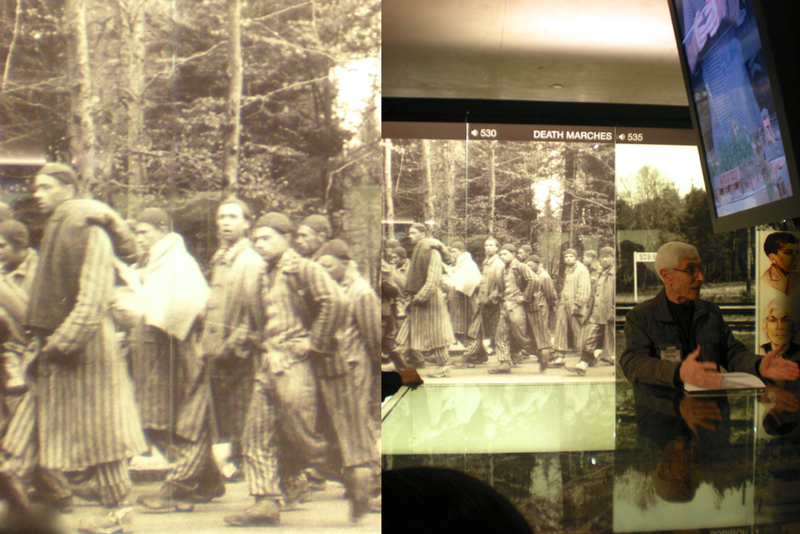 As our guide explained the Sobibor layout, this haunting photo of the men behind him seemed to come to life. Imagine them in other clothing, in a different time and setting. They could be loved ones, celebrities or athletes we admire. They could be us. Genocide still exists today, a fact that brings to mind a quote from Miep Gies: "I certainly think that another Holocaust can happen again. It did already occur; think of Cambodia, Rwanda, and Bosnia." But she also had a message for young people before she died at age 100: "Children who use the Internet are much better informed than when I was young. Use this to your advantage." Now we arrive at the deepest and darkest part of the museum, low ceilings, low light, with deathly prison suits limply hanging. Monitors representing eighteen different concentration camps deliver sordid information that we need to know - so we don't forget. Mournfully, on the screens of each monitor, stories unfold.